Lodge Brothers in Ashford recently conducted the funeral of 21 year old Amber Kathan, who’s life was tragically cut short less than a year after being diagnosed with Epithelia Sarcoma. Before Amber died she told her mother Averil, about her dream of starting a respite project to help homeless people and those impacted by domestic violence. Unlike other mainstream charities, Amber’s idea centres around helping those who need help but who also have pets to care for too. 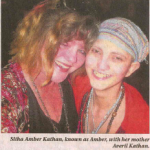 Mrs Kathan is now determined to take the project forward with the help of a group of friends who supported them both through the past year, aptly called Amber’s Angels. The charity will be called Amber’s Foundation.